Home Gear What Are The Best Tactical Gloves In The Market Today? Look, we’re all for living on the edge— riding big bikes, climbing mountains, going for a good game of airsoft, taking on long hikes and taking down bad guys—but we’re also big on protecting oneself. Especially one’s hands. Can you imagine the hassle of injuring your mitts? We’ve been there and it ain’t pretty. That being said, a good pair of tactical gloves is a must-have for every prepper, outdoorsman or hey, even for an average joe. The right glove will help protect your hands from injury, keep them warm and maintain tactility. It also provides adequate support and prevents repetitive stress damage to your hands and wrists. But with so many tactical gloves in the market today, how do you separate the wheat from the chaff? Well, that’s where we come in. We know you’ve got a lot on your plate so we did the heavy lifting for you: we reviewed and tested 7 of the best tactical gloves in the market today. 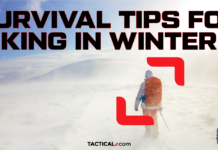 What Should You Look For In Tactical Gloves? First things first: what are you using those gloves for? There are tons of tactical gloves out there and each kind caters to a different need. The best way to pick the right glove is to first zero in on your needs. For example, if you handle firearms in your line of work or if you love to hunt, you’d need a glove that would allow you extreme tactility and dexterity when shooting. You might want to forego additional protective layers in favor of a thinner glove that gives your fingers sensitivity while on the trigger. On the flipside, if you work outdoors or expect your hands to be pretty banged up, you might want to invest in a glove that has features like hard-shell knuckles or reinforced palm grips. Military, law enforcement or first responders need robust gloves that can protect them from cuts or fire, so Kevlar lining might be a huge factor to consider. Once you’ve identified your needs, it would be way easier to come up with criteria and narrow down your choices in terms of material, protective features and the like. The most common synthetic fabrics include neoprene and nylon composites. These materials are known for their lightness, strength, and durability, as well as their moisture-wicking properties. Other gloves are made from natural materials like goat hide or sheepskin. These types of animal leather are soft and yet durable, so they’re great if you want to keep a low-profile glove that doesn’t kill your dexterity. A durable synthetic fabric primarily used in making bullet-proof vests and the like. Gloves with Kevlar lining can generally withstand flames and cuts, making them slash- and scorch-proof. Aside from having Kevlar lining, some gloves sport additional protective features like padded or armored knuckles. These knuckle reinforcements can be made from materials like thermoplastic rubber, ballistic nylon or hard plastic. Other protective reinforcements include paddings on the heel of the hand, on the index knuckles and trigger fingers to absorb force and pressure. There’s a reason why people use the phrase ‘fits like a glove’ to describe something that’s got the right size and shape. If you pick one that’s too small or tight, you’d risk impeding your mobility. Choose something too big and you’d have a hard time controlling your grip and movements, too. Thus, never underestimate the power of choosing the right size of glove. It’s usually a matter of trial and error. The glove has to close securely around the wrists, fit your hand comfortably and have little space around the finger areas. Can’t fit the gloves in person? Use a sizing chart. Most, if not all, glove companies have a sizing chart available for your reference, so if you can’t test the gloves out in person, make sure to measure your hands first before ordering. Your tactical gloves are meant to withstand a lot of use and abuse, so make sure they’re durable. Don’t just examine the material; you also have to consider the quality of the gloves’ construction too. Watch out for fraying ends and loose threads. Dodgy elastic cuffs and closures? Say pass. Pick a glove that has nice and strong double stitched seams instead. Make sure that the wrist closures and velcro straps fit snugly, too. A good grip is a non-negotiable, especially when you need to shoot. Some shooting gloves come with notches along the fingers for added flexibility. Other gloves have textured anti-slip features on the fingers and on the palms to improve grip. Touchscreen devices like smartphones and tablets have now become a fixture in our daily lives. If you need to use a touchscreen device often, consider a glove that allows you to manipulate these gadgets with ease. As with all our reviews, our tactical gloves review began by searching high and low for the best products in the market today. We looked at dozens of online reviews, hung out at forums and read hundreds of customer feedback before narrowing our list to the top 7. 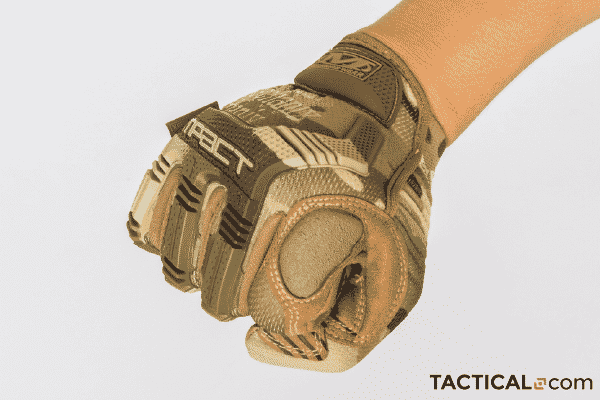 There’s a lot to love about these tactical gloves from outdoor and survival brand Tac9er, but what really impressed us was its Kevlar lining. They practically made this pair of gloves impervious to cuts and high heat— and trust us, we tried to destroy this glove. It didn’t budge. Next, the hardshell knuckles. If you need a lot of protection on the job, during combat or just need a robust glove that can take a beating, this is a good pair to get. The glove’s tough plastic knuckles may get scratched in the process, but your hands would remain safe. The Tac9er has a comfortable fit as well. The glove fits securely as it has both palm and wrist straps. The cuff is made of neoprene, which is breathable and has moisture-wicking properties. Since it’s pretty warm and snug, you won’t have any trouble when wearing this pair during the colder months. We also like how your fingers remain sensitive enough for shooting and other tasks that require dexterity. Though it’s got additional protective layers inside and reinforced palm grips, the glove still allows you a full range of motion. Its forefinger and thumb are also touch-screen compatible, so you don’t have to take them off when you need to use a smartphone or tablet. It’s pretty safe to say that the Tac9er Tactical Glove checked all our boxes and passed our tests with flying colors. It’s also pretty affordable at $29.99, so you really get the best bang for your buck. Mechanix is a brand that’s been in the game for so long that it’s almost interchangeable with the words “hard, sturdy work gloves”. The Mechanix Multicam M-Pact Tactical Glove is a step above the usual Mechanix M-Pact workhorse. It’s still got the same TrekDry technology and the usual workmanship you’d expect from a Mechanix glove, but it’s also got a ton more features that would make it great for people in law enforcement or the military. Think of it as a Mechanix glove on steroids. For one, it comes in a nice camo color— the only one on this list, actually. Then you get a thermoplastic knuckle guard that extends all the way to the tips of the fingers. It’s not as “tough” as the hard-knuckle variety, but it does afford you a bit of flexibility— so it’s a kind of middle ground from those hard-knuckle gloves and those without it. The biggest difference between this glove and the usual Mechanix Mpact glove is the palm. It’s equipped with tons of protective material: you’ve got Armortex reinforcements along the index knuckle and D30 paddings on the heel for added protection against high-impact force. If you’re someone who’s in the shooting range a lot or just a regular Joe who does robust jobs, this might be a good match for you. It’s kind of chunky though, so if dexterity is your main priority or if you’re doing lots of fine-motor tasks then there are other gloves that might better suit your needs. You also wouldn’t want this if you need to use your smartphone a lot. Although its reinforced thumb and forefinger are advertised to be touch-screen compatible, we didn’t find that to be true upon testing. You can’t find an inch of Kevlar on this, too, so it’s not the best if you need a slash and scorch-proof glove. It’s great enough for some tough jobs, but don’t go handling hot coals with it on (we ended up singing the material). Overall, the Mechanix Multicam M-Pact Tactical Gloves are great for tough jobs and even military operations. They’re a bit on the chunky side, but will offer adequate protection even if the touchscreen feature is a bit dodgy. And here we’ve got the notorious PIG. PIG gloves are known for their snug fit and “barehand” sensation. How do they hold up against the bigger, bulkier gloves in this list? At first glance, these PIG gloves look nothing out of the ordinary. The pair we got was black and slate gray and they were markedly thinner than the rest of the gloves in the lineup. The fit is slightly snugger than the other gloves, too, so prepare to really squeeze in. If you’ve got big hands, you might consider buying a size up. The knuckles are reinforced with stretch ballistic nylon, and while you can’t break a perp’s nose with it, it can sure protect your hands from most of the stuff you’ll encounter while out on the field. While not flame resistant, the PIG gloves are more or less slash-proof. These PIG gloves may not be the best gloves when you need a cozy pair during the winter, or if you’re doing crazy rough jobs, but they are a perfect fit if you need dexterity. True to their promise, PIG gloves feel like a second skin. Its snug fit does not impede your mobility and dexterity at all. In fact, it retains your dexterity while providing some protection at the same time. Each finger has notches allow flexibility and dexterity. It’s also very breathable. Instead of additional paddings along the palm, you can find ventilation holes, so sweating wouldn’t be an issue. If you need a pair of gloves for shooting or if you hate taking your gloves off when doing small tasks like firemaking or setting up snares, this pair would be a good bet. We also love that it’s truly touchscreen compatible. It’s like using the phone with your own fingers. All in all, the PIG’s greatest strength is that it allows your fingers to stay nimble. They may not be the warmest gloves out there, but if you need deft hands as in shooting, these are a great pair to have. The 5.11 ScreenOps Tactical Gloves look so sleek and fancy that they might be better suited for Batman’s butler than Batman himself. Its palms are seamless and there’s hardly a stitch out of place. It’s also lightweight without a lot of bells and whistles. How does this sleek number compare to the more rugged gloves on this list? The 5.11 ScreenOps performed really well when put to the smartphone screen test. It’s compatible with most, if not all smartphones and it works without a hitch. The fit is snug but not restrictive. The sheepskin leather makes the glove quite supple, although not slash-proof. Since the palms are seamless and smooth, you won’t have as much traction in your grip. Apart from these minimalist, if not ordinary, qualities, there’s really not much to say about the 5.11 ScreenOps Tactical gloves. It does a stellar job with its touchscreen-compatible features, but apart from that, it’s just a pretty motorcycle glove. Good for EDC or riding perhaps, but not for rugged jobs and activities. Amazon customers love their JIUSY Tactical gloves and if you consider the price point, it’s really no wonder why. These chunky gloves are dirt-cheap at a little more than $14. The question is, are they any good? Looking at the JIUSY, you’ll first notice its knuckle guards. They’re huge! They’re made from thermoplastic rubber, so it’s bulky yet capable of diffusing force applied to your knuckles. They fit well enough if you make a fist, but they’re quite awkward when you spread your palms out. They’re also not the comfiest things to wear if, for example, you need to reach into your pockets or if you need maximum dexterity. You can find leather reinforcements on the thumb and middle finger for touch screen capabilities. There’s no Kevlar lining the inside of the glove, so the material may burn or get easily singed when exposed to extreme heat. The wrists straps make for short cuffs and they can turn loose with activity. All things considered, you get what you pay for with these gloves. They don’t have the most finesse nor are they the most dexterous, but they’re enough for everyday chores and the like. It’s the glove to use when you don’t mind your gloves getting dirty or damaged due to overuse. 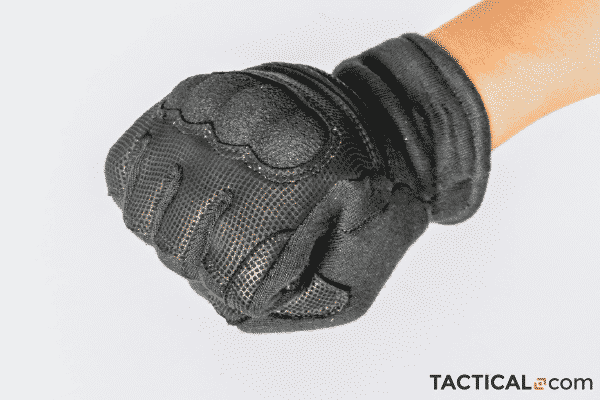 The Hatch Street Guard Tactical Glove is one of the thinner gloves on this list, but it’s one of the few lined with Kevlar. Lots of people swear that this glove can take a lot of tough jobs even if it lacks in bulk, and we wanted to find that out for ourselves. It’s quite similar to the PIG but not as thin nor dexterous. The wrist straps leave a lot to be desired; we would’ve wanted them to be more secure and snug. We like that it’s got protective padding in that vulnerable space between your forefinger and thumb, though. Manipulating the smartphone screen is a bit of a hit or miss, too. The upside is that this glove has Kevlar lining so although it’s quite thin, it can take some slashes and abrasion. It’s pretty resistant to high heat, too, so that’s a plus. All things considered, the Hatch Streetguard has a lot of desirable qualities. While the wrist straps and touch screen capabilities need a bit of work, the rest of the glove’s features are pretty solid. Like Tac9er, Hatch and 5.11, Rapdom is a glove equipped with Kevlar lining. Unlike those gloves however, it just doesn’t quite deliver. First, the wrist straps are absent altogether. The glove has a “slip on” feature so there’s no velcro or self-fasteners in place. You just get an elastic cuff, which doesn’t look or feel too secure. If anything, this pair resembles clunky old gardening gloves. They’re bulky and are not dexterous at all. Its touch screen compatibility feature is a no-go, and its knuckle guards are too rigid to conform to the shape of your fist. On top of that, this glove started fraying at the wrists within a day of testing, which was disappointing but not totally unexpected. Perhaps the only saving grace of this glove was its Kevlar lining, which makes it resistant to high heat and abrasions. But since there are other Kevlar-lined gloves on the list that performed tons better, we’ll skip this one. There’s no such thing as one perfect tactical glove because it really depends on the person’s needs. A marksman or a member of the law enforcement could have a different ideal glove compared to, say, a casual biker or someone who’s in construction. Still, considering the overall quality and price-performance ratio, we gotta say that the Tac9er tactical glove impressed us with flying colors. Its Kevlar lining didn’t budge even when we did our worst to cut or burn through it. It’s pretty comfy as well. The Mechanix MultiCam M-Pact Tactical Glove was pretty neat, too, especially if you need a robust glove for robust jobs. In terms of tactility, PIG’s snug fit checked all of our boxes. Now, over to you. Which of these gloves do you wanna try out first? Have you used any of them for work or for fun? Tell us about your experiences in the comments below!